About this time two years ago, I walked out of my screening of Catching Fire, the second installment of The Hunger Games franchise, literally on fire. I had seen a sequel that was better than the original, by far. A movie so good it could stand alone as a sci-fi action masterpiece. I stand by that. Then, last year about this time, I left Mockingjay, Part 1 fully unsatisfied. I had gotten a pretty much scene-by-scene adaptation of barely half of a book that I only sort of liked to begin with. In the days of movie studios splitting apart and dragging out and rebooting and remaking entertainment for cash, we, the audience, find ourselves repeatedly dragged into mediocre movies that don't have to be mediocre. They don't have to be mediocre because Catching Fire isn't. Mockingjay, Part 2 picks up right where Part 1 left off. Katniss (Jennifer Lawrence) has been beaten down by her friend/lover/Games winner Peeta (Josh Hutcherson). Peeta has been brainwashed by President Snow (Donald Sutherland) and the Capitol to the point of complete fear and full mistrust of Katniss and the District 13 rebel uprising, led by President Coin (Julianne Moore). 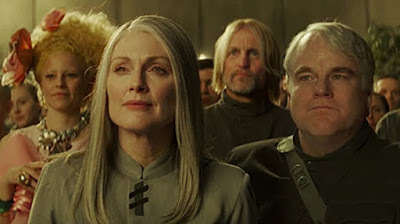 But Coin's plan remains--under the guidance of Haymitch (Woody Harrelson) and Plutarch (the late Philip Seymour Hoffman), Katniss will continue her mission to be the voice and symbol of a new Panem, the Mockingjay. Not only is Katniss dealing with her unwanted leadership position but also her simultaneous love and fear of Peeta, her confusion about her best friend Gale (Liam Hemsworth), and her need to protect her sister, Prim (Willow Shields). She is also at odds with two leaders in the two presidents, neither of whom are fully trustworthy. She just wants to fight, to hunt, that's what she does best. She wants to be the one to kill Snow. And that's where this movie picks up its pace, though it loses it in interludes (read on for more) that fall a bit flat. It is hard to recap the plot of this final installment for reasons that ultimately lead to its downfall. I won't do it. It is too much plot. Novels have the luxury, especially first person narratives like Suzanne Collins' trilogy, of being able to develop such a plot with the thoughts and feelings of the narrator. The film version of this final film, as wonderfully realized, great looking, and well-acted as it is, is too focused on fitting in EVERYTHING from the source material that the fun just seems sucked out of it, especially for someone who has read the books. There are some exciting action sequences and set pieces here, most notably the series of traps, or Pods, set inside the Capitol as Katniss, her film crew, and her unit of soldiers make their way to a final destination, a showdown with President Snow himself. Consider the most exciting of these sequences as a trap is set off, releasing tons of gallons of oil into a courtyard instigating the best of the many great chase sequences this film has to offer. Another finds an army of Mutts (humanoid alien-type zombie creations bent on eating our heroes alive). This is all fun and exciting and perfectly executed, yet these scenes come in between long stretches of What does it all mean? and Which boy will Katniss choose? I found myself bored with these interludes in the film. They worked much better on the page. The first two films of The Hunger Games series trimmed the fat from the books. They were smart enough to realize that movies aren't novels and vice versa. I suppose there are people...well, I don't suppose because my wife is one of them...who love the straight book-to-screen adaptation, which, in the case of Mockingjay, is a four-and-a-half hour movie of a novel that is really not that much longer than the first two. I am not one of those people. Director Francis Lawrence, who took over the franchise from Gary Ross after the first film, made a movie in Catching Fire that ran at a perfectly paced two and a half hours that kept all of the necessary thematic elements and went fully balls-to-the-wall with its action. It is, in all honesty, a better movie than the novel is a novel. I wish the studio had let this guy get a team of writers willing to do what they did with Catching Fire to Mockingjay. Make one movie, release it one time, and let's be done with it. I'm probably in the minority on that as fans of the books. I read the book. I don't need to see the entire book as a movie. It made the whole thing predictable to the point of boredom...at times. I can't complain about anything else. 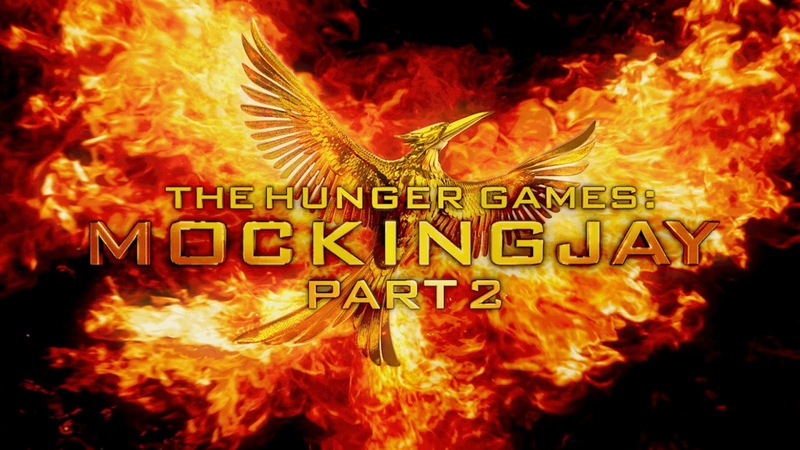 Mockingjay, Part 2 is a well-made sci-fi actioner. The cast is full of greatness, ranging from Oscar winners in Jennifer Lawrence, Philip Seymour Hoffman, and Julianne Moore to a classic all-time greats in Donald Sutherland and Woody Harrelson to new, young stars in Josh Hutcherson, Liam Hemsworth, and Natalie Dormer (the director of Katniss' "Propos") to great character actors in Elizabeth Banks and Jeffrey Wright. The production is world-class in its cinematography, editing, score, production design, and special effects, which are flawless. But the question remains: Will I want to sit and watch this movie for fun at home one day? Not really. It's two halves aren't that good separately and, as a whole, it's just way too long. I'll just watch Catching Fire. And that's just as well. I'll say one thing about The Hunger Games franchise. There is a masterpiece among the four films, featuring the perfect teams in both cast and crew and a star in Jennifer Lawrence, who I love more than any other actress today. Note: Seeing Philip Seymour Hoffman one last time was a heartbreaking experience and the way the filmmakers were able to integrate his character into the story after he was unable to continue his performance really worked. I miss you, Phil. Note: The new full trailer for David O. Russell's Joy, which ran before my screening of Mockingjay, Part 2, is fantastic. Those of you out there downing the continuing collaboration between Russell, Lawrence, DeNiro, and Cooper need to get over it. Joy looks exactly like everything I want in a movie. You said it better than I did regarding the "interludes" of the film. It didn't work. I hated the whole Gale/Peeta/Katniss love triangle to begin with, but seeing it placed in this war movie was even worse. I'm with you that Mockingjay should've been one film. Splitting it in two ultimately hurt it. I hope this would be a big indicator to studios that splitting doesn't always work, but it won't because money. Money money money. I tell you what. It really screws it up for us, the ones who really appreciate cinema. I agree about the love triangle. That always felt forced, even in the books, and really weakened Katniss as a character. It's like Collins was too worried that if she didn't Twilight it up at least a little, nobody would care. I would've. I haven't seen Part 2 yet, but I will do soon, begrudgingly. I loved the books, but the movie series has just been dragged unnecessarily. Hopefully this isn't the way forward for every book adaption! I so agree! I'll be looking out for you review. I definitely liked part 2 of Mockingjay more than part 1. I seriously doubt I'll ever watch part 1 again, but I could probably sit through part 2 again at home. JLaw brings supreme acting even to this one. Great review! Thanks! I can't say which one I liked better. I can't get past them as just one really long (way too long) movie. Not that there aren't some satisfying elements, but it was just too much..